The "V2-Mask" will replace the V-Mask and 89xx series masks. 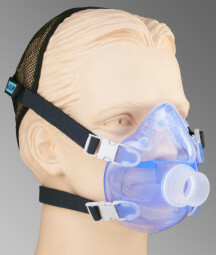 This translucent blue face mask has a anatomically contoured face piece and sealing flange shape with ribbed support on the nose area for a leak-free comfortable fit. Anatomically contoured design with ribbed support for leak-free ventilation and patient comfort. All headgear, including new Quick-Release Headgear sold separately. Sensa Seal provides an additional sealing surface around the bridge of the nose when needed. Listed below, order headgear separately. All port adapters made of autoclavable polysulfone plastic, they mate to all 5 sizes of face pieces listed here. VKIT: Includes S-M-L Face pieces, adult headgear and adapter R200583 (Adapter in photo below).